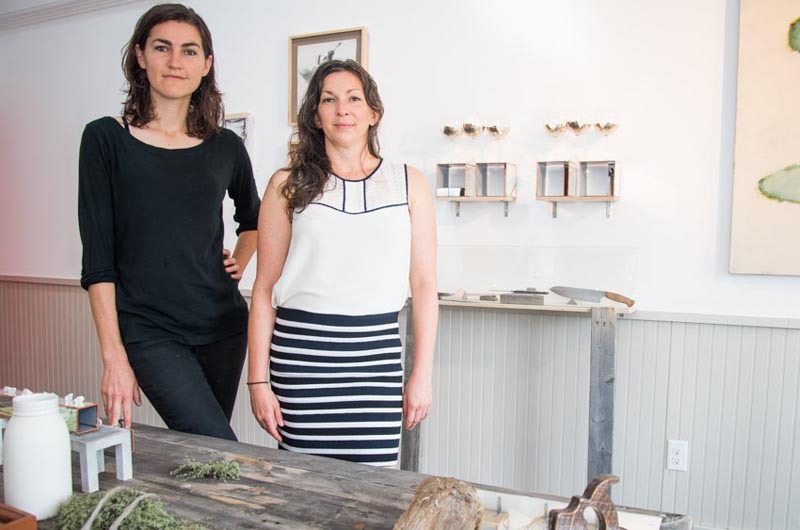 Whitney Blank and Deanna deVries have just opened CRFT SHW gallery in Vineyard Haven. At Five Corners in Vineyard Haven, while morning clouds slowly dissolve to reveal a sapphire summer sky, a new sign sways outside of 13 Beach Road extension. The seven sans-serif upper-case consonants spell out the name of the Island’s newest art gallery. Well, sort of. Spelled CRFT SHW but pronounced craft show as if it had vowels, the sign ushers visitors into a 400-square-foot studio space just opened by Whitney Blank and jewelry maker Deanna deVries. 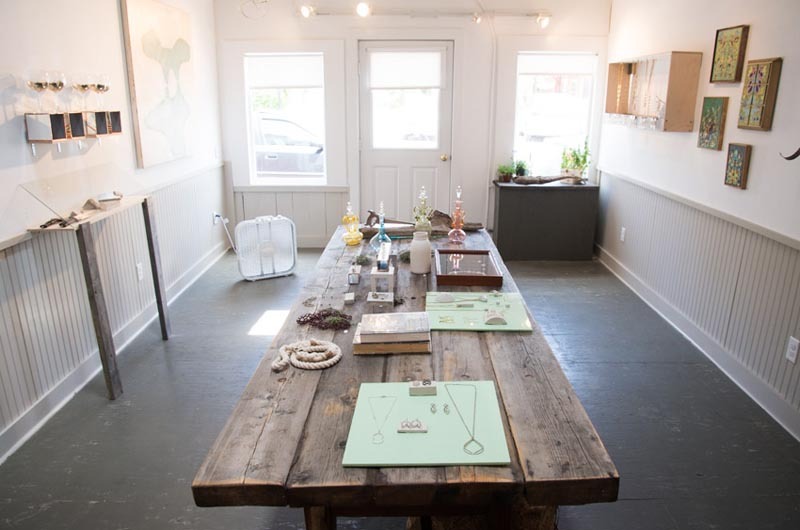 The gallery doubles as Ms. deVries workshop and features her line of unisex jewelry ­— necklaces, earrings, cuff links and bracelets made with non-traditional materials. 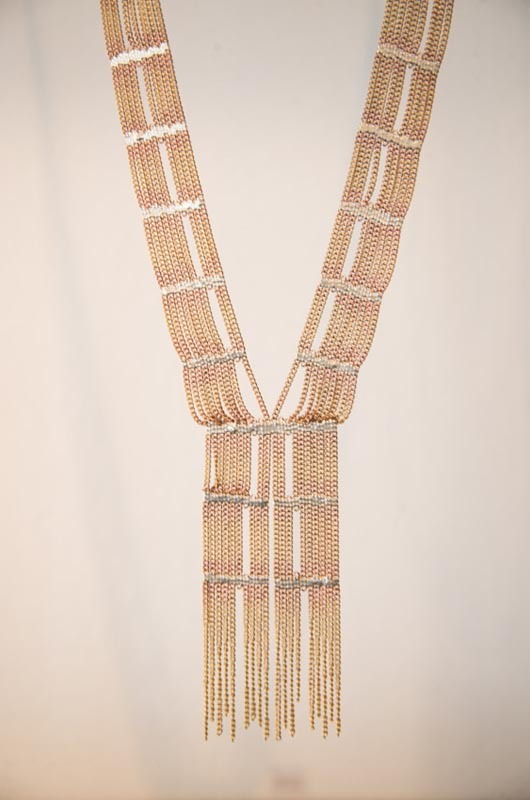 Many of her pieces combine concrete with 14 karat gold, brass, gold-plated or sterling silver. There are also numerous items on display and for sale made by other artists. A table created by Tim Laursen with wood scavenged from an old firehouse holds court in the center of the space. It’s for sale, but “for a high price because we love it and really don’t want to sell it,” said Ms. Blank. There is also fine art photography by Elizabeth Cecil, a painting by Jenny Christy and jewelry designed by Nettie Kent. Artist Enid McEvoy sewed weekender bags for the gallery and displays her quilts inside the studio, too. Glass buoys by sculptor Wil Sideman decorate the floor, and handcrafted jewelry and accessories by Stacey Lee Webber align the walls. 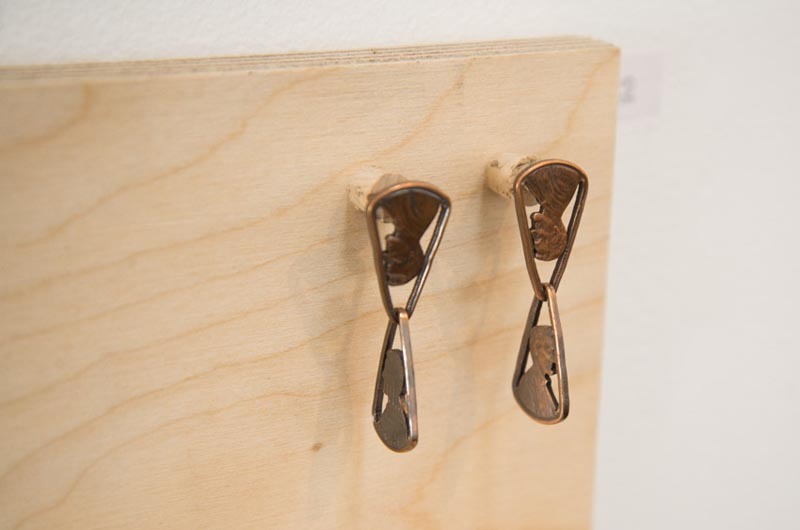 Work by Hannah Keefe, Colin Ruel, Elysha Roberts, Jesse James, HeyDay, Duncan Niederlitz, T. Davlin, Andrew Meers and Iwalani Kaluhiokalani round out the space. Owning her own gallery has always been a goal of Ms. deVries’. But she never thought she would open one 3,000 miles away from Los Angeles. To understand more of the artist’s journey to Martha’s Vineyard, let’s rewind a bit and go back to Florida, of course, and clogging, naturally. Ms. deVries grew up in Florida, and used to go clogging with her grandmother, perhaps her first creative outlet. Later, after high school, she continued exploring movement and rhythm through modern dance at the Massachusetts College of Art & Design in Boston. In college she began to gravitate to the visual arts, too, such as glass blowing, painting, jewelry making and metal smithing, eventually earning a degree in fine arts in metals. Ms. deVries cites modern dancer Martha Graham as her artistic inspiration. After college she moved to Los Angeles and worked as a project manager for an interior design company — she designed and constructed a closet for Justin Timberlake. But in 2008, when the economy took a turn for the worse, she was laid off. To fill the gap she turned back to rhythm, not clogging again, but playing the drums, and joined a band called Wet & Reckless. It was another artistic outlet for Ms. deVries, and the one that would introduce her to Ms. Blank. Ms. Blank’s story is a bit different. She grew up in Los Angeles. Her mother was a court reporter and her father was a nuclear consultant with a photography hobby. Ms. Blank gravitated to film, both still and video. Her given name is actually Whitney Patterson, but there was another photographer with that name in Los Angeles, so she changed her last name to Blank after Jerri Blank, Amy Sedaris’ character in the Comedy Central series Strangers with Candy. Ms. Blank, now 28, graduated from the University of California Los Angeles with a degree in international development. For a time she travelled the world working for relief organizations. She lived in Peru, Argentina, Bangladesh and Spain and can say “I am a monkey” in 12 different languages. She also plays guitar, one she’s had for almost 20 years: a Jimi Hendrix-style maple flat top natural board with a white pick guard. She joined Wet & Reckless. Eventually the band did what all bands do — they packed up their equipment, hopped in a van and went on tour. They played throughout the East Coast, the final stop in Oak Bluffs. The band decided to play on the Vineyard because they had a mutual friend from Los Angeles from the Island, Lizzie Kent. “She is why we came to the Vineyard. We stayed at her mom’s yurt. There were chickens everywhere,” said Ms. Blank. Back at the art gallery, a gauzy light shines through the window and Ms. Blank, who has jet black hair and posture identical to the pencil she tucks behind her ear, sips iced coffee from a glass jar. She brewed it herself. “I roast my own coffee beans at home in an old popcorn machine,” she said. Crafty. Very crafty. The conversation switches to the name of the gallery, which Ms. deVries said started with a text message she received from her mother. mom: I’m with my friend at a CRFT SHW. She said the text gave her the initial idea to name a gallery something off-beat. “And something without vowels,” Ms. Blank added. “I thought it would be the perfect name for a gallery,” said Ms. deVries. “Because it’s young and not normal,” added Ms. Blank. “And it’s unique,” Ms. deVries said. CRFT SHW Gallery is located at 13 Beach Road extension in Vineyard Haven (at Five Corners near the tall ships). Visit crftshw.com for more information.